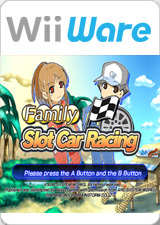 Daddy, Mommy, Sarah, and Billy are putting the pedal to the metal in Family Slot Car Racing (Okiraku Slot Car Racing Wii in Japan)! Race through three racing circuits, each composed of multiple race tracks and even bonus tracks! You can race against a friend for some friendly one-on-one racing action! Choose among multiple slot cars with varying designs to see which has the best grip and speed! As you progress you'll unlock new courses and even new slot cars to help you reach the top of the racing circuit. Do you have it in you to be the fastest racer on four wheels!? The graph below charts the compatibility with Family Slot Car Racing since Dolphin's 2.0 release, listing revisions only where a compatibility change occurred. This page was last edited on 16 January 2018, at 06:17.